MOSUL, Iraq: Elite Iraqi troops battled ISIS in the streets of Mosul Friday as U.S.-backed forces in Syria pressed an advance on extremist bastion Raqqa after a sandstorm eased. The high winds in the desert which separates the Syrian Kurdish-Arab militia alliance from the extremists’ stronghold in the Euphrates Valley had slowed their advance Thursday as visibility levels plummeted. Iraqi forces too had regrouped after meeting stronger than expected resistance from ISIS fighters on the east bank of the Tigris River which runs through Mosul after thrusting into the built-up area last week. The extremists had been expected to pull back to the west bank, a stronghold of Sunni Arab insurgency even before ISIS swept through the minority community’s heartland north and west of Baghdad in mid-2014. Commanders of Iraq’s elite Counter-Terrorism Service (CTS) said that troops were advancing on two eastern neighborhoods of the city. The battle to retake Mosul is now in its fourth week, and while troops have entered the built-up area, there are weeks, if not months, of fighting still to go. 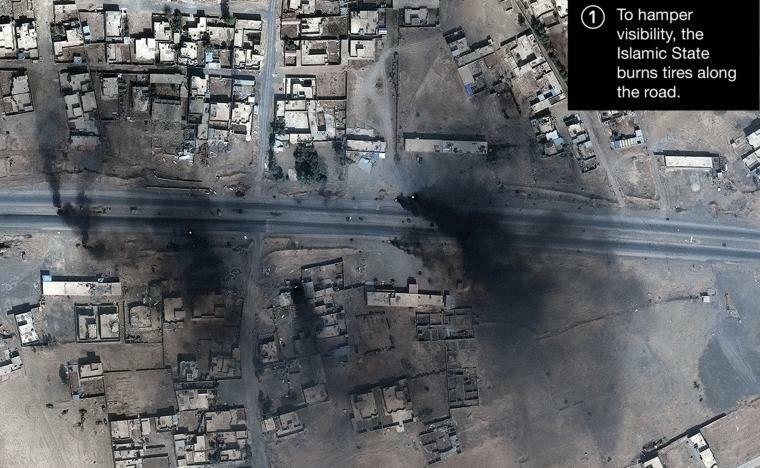 “Our forces have begun the attack on Arbajiyah. The clashes are ongoing,” Staff Lieutenant Colonel Muntadhar Salem said, referring to an area in the east of the city. The latest fighting came “after a few days of quiet,” he said. Another CTS officer, Lieutenant Colonel Ali Hussein Fadhel, said that the first row of buildings in Arbajiyah had been seized. “We are within firing range of Karkukli but the full attack has not yet started,” he said, referring to another eastern neighborhood. In a makeshift command post in a two-story house, a CTS soldier used an iPad to control a reconnaissance drone on the lookout for extremist suicide bombers. Iraqi forces launched the operation to retake Mosul on Oct. 17, with federal and Kurdish regional forces closing in on the city from three sides. Pro-government Shiite paramilitaries later began an advance on the town of Tal Afar, which commands the city’s western approaches, with the goal of cutting the extremists off from territory they control in neighboring Syria. The advance up the Tigris Valley from the south has been slowest. The troops on that front had the farthest to cover, with a string of extremist-held towns in their path. On Thursday, the battle neared the remains of ancient Nimrud, some 30 kilometers (20 miles) south of Mosul, raising fears for the famed heritage site already ravaged by extremist bombs and sledgehammers. In Syria, the U.S.-backed Syrian Democratic Forces (SDF) said their advance on Raqqa was back on track after a sandstorm which swept through the area Thursday eased. “We seized control of two new villages yesterday but we didn’t advance as far as planned because of the sandstorm,” SDF commander Merkhas Kamishlo told AFP. Fighting has focused on the ISIS-held village of Al-Heisha, around 40 kilometers (25 miles) north of Raqqa. An AFP correspondent reported heavy airstrikes Friday morning by the U.S.-led coalition supporting the SDF forces. 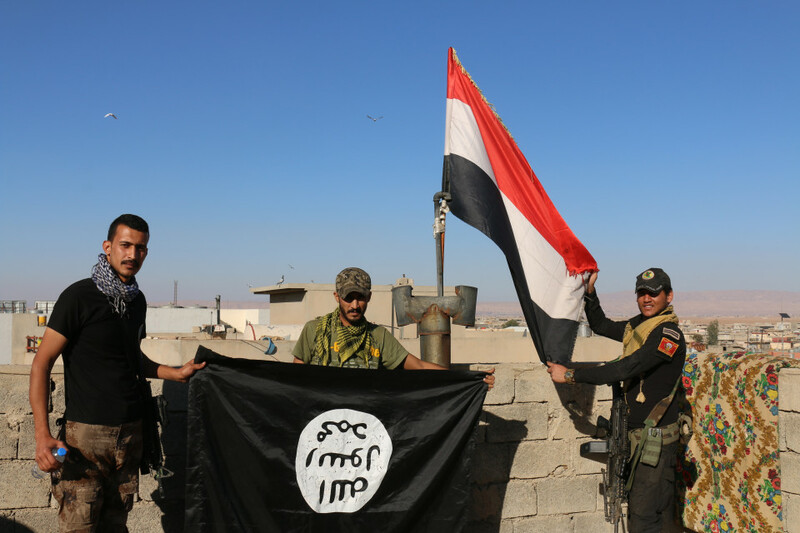 “Al-Heisha is totally besieged and overnight the U.S.-led coalition hit four Daesh positions inside the village, and destroyed a vehicle being prepared for use as a bomb,” Kamishlo said, using an Arabic acronym for ISIS. The SDF launched its offensive last weekend and has been pushing south from areas near the Turkish border towards Raqqa. Kamishlo said SDF forces advancing south from the towns of Ain Issa and Suluk were close to converging at a position some 30 kilometers (20 miles) from Raqqa. “The situation is good, the operation continues,” SDF spokeswoman Jihan Sheikh Ahmed told AFP. Dozens of families have been seen fleeing towards SDF lines in recent days. Many have been arriving in trucks and cars, loaded down with belongings and in some cases with livestock including cows and sheep. Raqqa had a population of some 240,000 before the eruption of Syria’s civil war in 2011 but more than 80,000 people have since fled there from other parts of the country. Mosul is much bigger, home to more than a million people, and over 45,000 people have fled since the offensive began. Aid workers have expressed fears of a major humanitarian crisis as fighting intensifies inside the city, where ISIS is expected to use civilians as human shields.